Leading heavyweight contender Dillian ‘The Body Snatcher’ Whyte 25-1 (18) played his get-out-of-jail-free card in the eleventh round to knockout Dereck ‘War’ Chisora 29-9 (21) in their highly-anticipated rematch at the O2 Arena in London, England on Saturday night. The 30-year-old from Brixton delivered a perfectly-timed left hook to the jaw in the penultimate round that stiffened Chisora’s body as he collapsed to the canvas. The WBC and WBO number one contender, who was defending his WBC Silver and WBO International heavyweight crowns, was declared the winner at the 1:56 mark of round number eleven. Despite the dramatic finish, Whyte – who is also ranked number four by the WBA – didn’t have it all his own way. 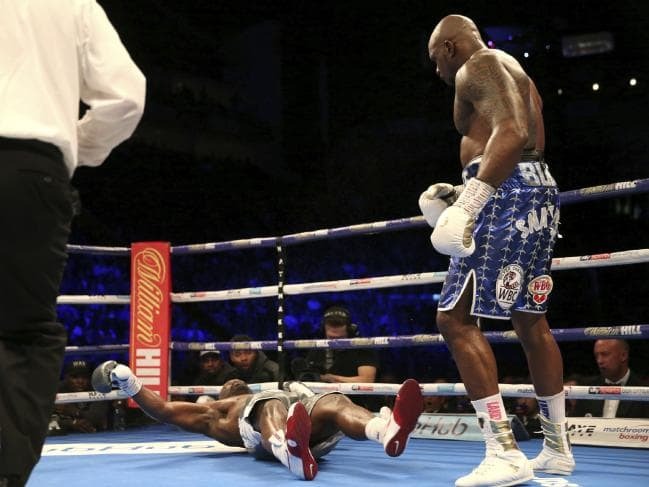 Chisora was the aggressor from the opening bell and his hard-charging style paid off early as Whyte struggled to settle into a rhythm as he boxed off the back foot behind a stiff jab punctuated by body shots. By the midway point of the fight the 34-year-old Londoner was outworking Whyte for large sections of the fight. But referee Marcus McDonnell docked Chisora a point in the eighth-round for a low blow and another in the 11th for errant use of the elbow that evened up the scores. By the time Chisora was separated from his senses in the 11th frame he was leading 95-94 on two of the judges’ scorecards while trailing by the same score on the third. In their first bout in Manchester almost exactly two years ago Whyte was declared the winner by split decision with scores of 115-113, 115-114 and a dissenting 114-115 in a contest that could’ve gone either way. This time around Whyte took the decision out of the judges’ hands. “I hurt him in the first round and thought about going after him but I had to tell myself to relax, you’ve got 12 rounds to do this,” Whyte said after the bout. “The main thing is being in control, taking my time, boxing my way and I knew it would come. Whyte is petitioning for a fight against WBA, WBO and IBF heavyweight champion Anthony Joshua 22-0 (21). The Jamaican-born bomber is desperate for the opportunity to avenge his TKO7 loss to the 29-year-old Olympic gold medallist at London’s O2 Arena in December 2015. Joshua is said to be pursuing a unification bout with WBC counterpart Deontay Wilder 40-0-1 (39) after the homerun-hitting American was held to a draw by Englishman and lineal champion Tyson Fury 27-0-1 (19) in Los Angeles earlier this month. “If there’s anyone who deserves a shot, if it isn’t Deontay Wilder, then it’s Dillian Whyte,” said Joshua, who is due to return to the ring at Wembley Stadium on April 13. The WBC has ordered an immediate rematch between Wilder, 33, and the 30-year-old self-styled ‘Gypsy King’ due to the debateable draw in their fight after Fury outboxed the ‘Bronze Bomber’ for long stretches of the fight before being dropped twice in the later rounds. Promoter Eddie Hearn, who looks after both Whyte and Joshua, insisted the rematch will happen at some stage in the future. “It’s a matter of when, not if,” said the Matchroom Boxing boss. “Dillian Whyte is going to become the WBC mandatory I think in September so it’s a matter of when, not if.